Employees at a postal processing plant in West Oakland have voiced concerns for years about a policy they say prevents most workers from calling 911 in a medical emergency. They say the policy causes deadly delays when workers are injured on the job. 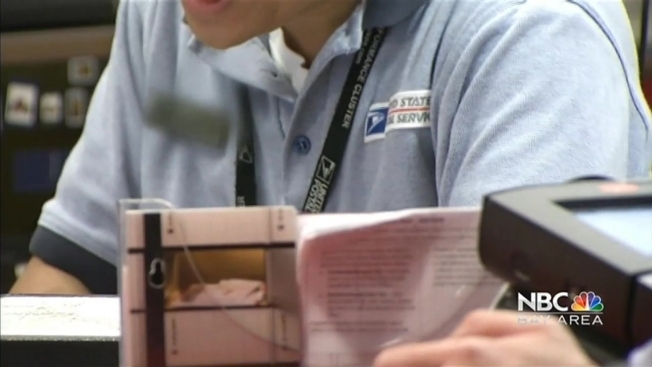 An NBC Bay Area investigation uncovered the United States Postal Service policy that instructs workers to call their supervisors and security in a medical emergency, not 911. According to USPS policy, only the postal police department is allowed to initiate the 911 procedure. Last summer, an injured postal worker was left bleeding on the ground for up to 53 minutes before postal police contacted 911. “When you see someone hurt, bleeding or passed out, the proper response is to dial 911 and then inform your supervisor—not the opposite way,” said Deborah Mealey, a 26-year veteran of the postal service. She is a lead mail processing clerk and a steward for the Oakland chapter of the American Postal Workers Union (APWU). A union grievance details what happened when postal service employees saw their coworker having a seizure. Now, new documents obtained by the Investigative Unit reveal a history of “delayed medical treatment” at the West Oakland processing and distribution center where nearly 2,000 people work. Union stewards, including Mealey, sent a grievance letter to postal service leaders in 2005. “I believe human life and safety is more important than postal policy pertaining to how they want things done when someone is hurt,” Mealey said. In response to the grievance, the USPS agreed that “the lack of prompt attention even to slight injuries could lead to more serious complications,” but the agency has not made any changes to its 911 policy since those incidents nearly a decade ago. Four months ago, in the early morning hours of Aug. 8, employees found Sam Macasieb on the floor, barely conscious, bleeding from his mouth and ears. According to an internal postal service report, employees didn’t call 911 right away. They proceeded to contact several supervisors and managers who then alerted the onsite postal police department, who finally contacted 911. Dispatch records show that up to 53 minutes passed from the time an employee says he found Macasieb to when the postal police contacted emergency medical personnel. The report concluded the employees and supervisors followed the 911 procedure exactly and that the “response was excellent.” It is unclear whether Macasieb’s outcome would have been different had he received treatment sooner, but 10 days later he died in the hospital, one month shy of his 60th birthday. Since then, other postal service employees have cited more instances of delayed medical treatment, which may have adversely affected their coworkers and even contributed to the death of yet another employee two decades ago. James Perry, a tractor trailer operator, remembers the day his friend and fellow truck driver Lionel Hankins collapsed from an apparent heart attack at the Oakland plant in February 1994. A summary of grievances sent to the USPS regarding delayed medical treatment at the West Oakland processing and distribution center. He said managers arrived at the scene and then called the nurse to assess Hankins. Perry said the nurse then notified the postal police and asked them to call 911. Perry believes the chain of events delayed his friend’s medical attention. Later that day, Hankins died at 58 years old. Augustine Ruiz, communications manager for the USPS Bay Valley District, said the Oakland facility doesn’t keep records that far back and can’t comment on the incident. Ruiz also said the USPS 911 policy is intended to summon professional medical help as quickly as possible and to allow postal police to direct paramedics to the access-restricted areas of the five-story building. He denies that employees are instructed not to call 911 in a medical emergency. “There is nothing that precludes someone from using their own cell phone and calling 911 themselves,” Ruiz said. Nearly a dozen employees, including Mealey, Perry and APWU Oakland chapter president Fredric Jacobs, said managers have warned that workers who call 911 would be responsible for the cost of the ambulance visit. Postal service leaders are giving out bad information, according to Stewart McGehee, the medical services manager for the Oakland Fire Department. “If you call 911, you are not responsible for any kind of a bill. It’s just as simple as that,” McGehee said. Ruiz denied that managers have told employees they would have to pay the ambulance bill if they called 911 directly. He said employees might be “misunderstanding” what USPS leaders have relayed to them. Ruiz also said that the USPS would revise the 911 policy, after the NBC Bay Area investigation exposed delays in securing medical help for Macasieb. More than six weeks later, the clock is still ticking. Following the NBC Bay Area investigation, the APWU took its renewed concerns about delayed medical treatment to postal service leaders in Washington D.C. But it is still unclear what, if any, changes the postal service has made to the policy. Employees say they have not received any new training on what to do in a medical emergency. In the wake of Macasieb’s death the question remains: Will the USPS empower its employees to call 911? It is a question Perry hoped he would never have to ask again, 20 years after his own friend’s death. If you have tips for the Investigative Unit call 888-996-TIPS or email theunit@nbcbayarea.com. You can reach Vicky Nguyen directly via email: vicky@nbcbayarea.com, Twitter: @vickydnguyen or Facebook. You can reach producer Liz Wagner directly via email: elizabeth.wagner@nbcuni.com.